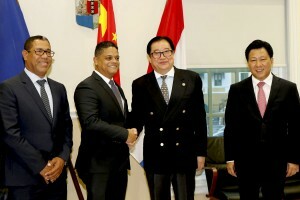 WILLEMSTAD - Tomorrow, during an extraordinary meeting of the Council of Ministers, the government will decide on Guangdong Zhenrong Energy (GZE) as the intended operator of the oil refinery after the contract with PDVSA has expired in the year 2019. Previously, it appeared that the Chinese state-owned company is financially and technically unable to carry out the modernization of the Isla. There is also no permission from the Chinese government for this. GZE came up with the Chinese private company Baota Petrochemicals as a second partner. That company has already indicated to the Multidisciplinary Project Team whether or not it agrees to implement the billions project. Tomorrow, the government will be informed of this decision.